A patented collagen supplement containing the same collagen fibres that make up the structure and foundation of healthy skin. A supplement that provides large amounts of the collagen fibres that keep the skin firm, tight, elastic. The same fibres are depleted with age; the loss of which cause the visible signs of ageing such as wrinkles and crow’s feet. 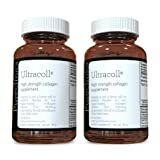 UltraColl Collagen supplement contains a patented blend of four different collagen fibres, each one is an essential building block in the structure of the skin. No other collagen supplement contains these same 4 fibres, most only contain collagen types 1 and 2 which alone have not been shown to help build the elastins and fibres within the skin, they are largely found in the cartilage of the joints. Only UltraColl contains all four of the same collagen types found in the deep layers of the skin that are responsible for keeping it looking young. These are collagen fibres I, II, III, and VII. UltraColl collagen fibres are sourced from a number of marine sources. While this is a more expensive process, it also produces a much purer and better collagen, especially when compared with the cheap bovine derived collagen that is often sourced from the by-products of animal slaughter houses. Formulated in 2006 to be the strongest anti-ageing collagen by BABTAC skincare experts, this is the best collagen supplement on the market still to date. This is due to patents and trademarks on the UltraColl collagen blend. This is for 2 bottles, each containing 3 months supply for a total of 6 months supply. At £44.98, that’s just £7.49 per month. This entry was posted in Buy Supplements and tagged 1000MG, AntiAging, Bottles, Collagen, Marine, Months, only, Patented, Supply, Tablets, Types, UC3x2, UltraColl, VII. by TOSMS. Bookmark the permalink.